Two Canadian National Railway derailments occurred on the same day – January 9, 2015. 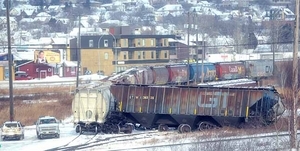 Four empty grain cars fell off the tracks in a rail yard in Thunder Bay, Ontario (Chronicle Journal). There were damages to the track that required repair. A CN freight car loaded with wood chips derailed in the Mont-Joli region of Quebec, forcing a Via Rail passenger train to end its journey in Mont-Joli (CBC News, Montreal Gazette). The Via train was travelling from Montreal to Halifax. 91 Via passengers had to wait between 5 and 7 hours before boarding buses to continue to their respective destinations. Read CN Railway Derailments, Other Accidents and Incidents for more information on CN derailments, spills, fires and explosions in Canada and the U.S.
~ by railroaded on January 13, 2015.